When an asteroid enters earth's atmosphere there are two occurences of extreme shock. 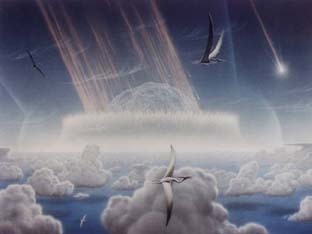 The first occurs as the asteroid enters the atmosphere. The second, more important one, occurs when the ejecta plume (the ejected debris caused by an impact) enters the atmosphere (Zahnle, 1990). This shock causes the breakdown of the oxygen (O2) and the nitrogen (N2) molecules found in our atmosphere. Through a series of chemical reactions the dissociation of the nitrogen and oxygen forms NO which is then converted into NO2. These two molecules can produce acid rain (HNO3) (Prinn and Fegley, 1987). In 1987 Prinn and Fegley determined the atmospheric consequences of a "large" comet impact versus a "small" comet impact. They assumed the "large" impact comet had a mass of 1.25 x 1016 Kg travelling at a velocity of 65 Km/s. As for the "small" impact asteroid, they assumed it had a mass of 5 x 1014 Kg travelling at a velocity of 20 Km/s. It is important to note that these two objects are possible bolides that hit the earth 65 million years ago. If the comet scenario occurred, 7 x 1040 molecules of NO would have been produced and subsequently converted into acid rain. (See chemical reactions ) This would have caused a global dispersal of acid rain with a pH of 0-1.5. As for the oceans, the global acid rain would lower the pH of the mixed layer (the top 75 M of the ocean) to a pH of 7.8, breaking down the calcareous shells of organisms that thrive in the mixing zone. If the "small" asteroid scenario were to occur, the amount of acid rain produced would be similar to the "large" comet scenario but only near the impact site. The global pH change would be rather insignificant.